One of Europe’s most respected Pike anglers, Henk Rusman of Holland, considers The Esox Cobra® Jig to be the Worlds best Pike jig. According to Henk, the Esox Cobra Jig excels in Dutch waters using a variety of plastic body baits. What follows is a translation taken from the Dutch magazine De Roofvis (The Predator Fish) of Henk’s field report using the Esox Cobra Jig. 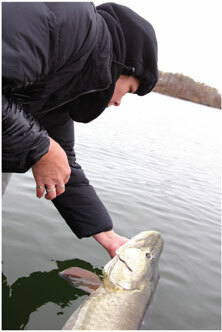 Field report by Henk Rusman An excellent presentation is to fish the Esox Cobra from the shallows into deeper water. That way it makes the nicest little jumps and won’t get stuck to the bottom so often. 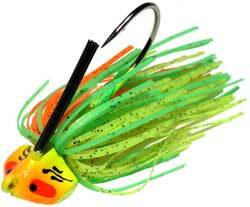 To avoid getting stuck on the bottom, the choice of jig head is very important. Round jig heads get stuck easier then flatted ones, but the best thing is to choose a so-called ‘ swimming’ jig head. And one of the best, if not the best for this type of fishing for me is the Esox Cobra. Because of the flatted bottom, this jig head seldom gets stuck. On top of that, this jig head stands almost upright on the bottom, which means that even mister Northern Pike can pick up your lure from the bottom. In contrary to many other jig heads, the Esox Cobra is made with an excellent and wide hook, on which even shad bodies and thick big grubs will find a place. The Patented and Trademarked Esox Cobra is designed and manufactured in the USA by Bait Rigs Tackle Company. This jig head that is excellent for the Dutch waters. The Esox Cobra looks like a crossover between a Erie jig and a banana model. The name ‘Cobra’ gives a good idea of it’s shape. With the 1/2oz weight this is a nice model to hold big grub tails and shad bodies and the shape of it prevents the whole thing from bulleting down to the bottom. When you retrieve this combination with this jig head it will go somewhat “planing” through the water, so that it will go through the striking zone. The sturdy hook is upright to prevent sticking to the bottom.